Locked away in the basement safe at the Duggan Welch funeral home on 17th street are old record books, some dating back to the days when the mortuary carried out funeral processions by horse and carriage. Steven Welch, the current owner, flipped through the pages. The earliest books are in his great-grandfather’s cursive. Later documents are in his grandmother’s handwriting and then his father’s and, finally, his own. After nearly 100 years in business — its centennial anniversary is officially next year — Duggan Welch Mortuary remains one of longest-enduring mortuaries on what once used to be a corridor of funeral homes. The records are a kind of family history, as well as a story of a changing San Francisco. Discharged from the military in 1900, Welch’s great-grandfather, William Duggan, found a regular gig driving a horse and carriage in San Francisco for Henrietta Hagan, the daughter of a funeral-parlor owner on Valencia Street. Duggan and Hagan eventually married, and Duggan entered Hagan’s family trade, opening his own funeral home in 1918 at 1234 Valencia St., now Yoga Tree. Over the next couple of decades, the street would become a corridor for preparing the dead. A trolley ran down Valencia all the way to Daly City to transport funeral processions to cemeteries outside the city. The train cars had special compartments for placing caskets and flowers, making Valencia an ideal location for a mortuary. 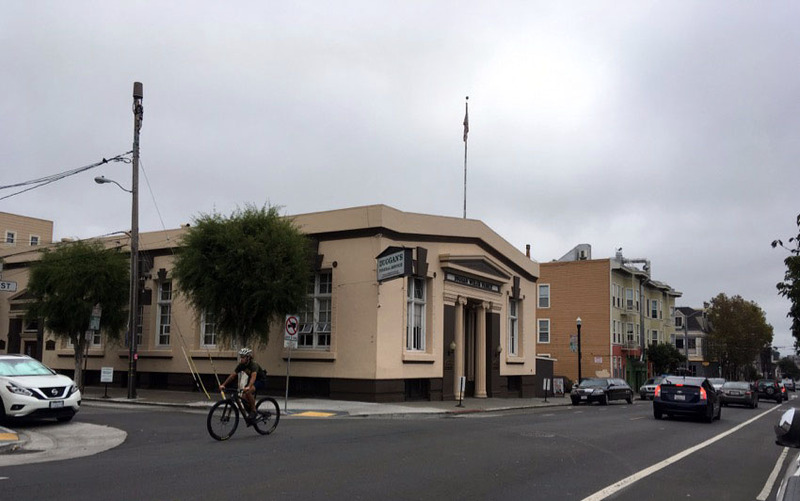 In the 1930s, the obituary section of the San Francisco Chronicle listed the Suhr and Wiebolt funeral home at 1465 Valencia St., near 26th; the mortuary of Barry and McDonald at 770 Valencia St.; St Anderson’s, on Valencia and 25th, and several others. Duggan purchased the funeral home’s current location in 1931. Before that, the building at the corner of Albion and 17th streets belonged to the Home Telephone company. In the early days, daily life at the funeral home had its peculiarities. A brick factory on San Jose Avenue had collapsed during the 1906 earthquake, and even in 1918 people were still chipping away at the mortar, trying to salvage the brick. According to family lore, the noise went on for years. Then there were the large, long-limbed greyhounds in the building’s backyard. William Duggan loved racing the dogs and owned several of them. One of them, Garyowen, won first honors at a 1923 race. Welch said that Duggan was known for taking the dogs onto the building’s flat roof, where they would play catch for exercise. Once, according to family legend, someone stole one of the dogs, and when Duggan figured out who it was, he took the man to court. Since both men claimed ownership of the greyhound, the judge had them stand on either end of the courthouse and released the dog to see whom it would run to. It came straight for Duggan. Duggan also became something of a local hero when he organized free funerals for two shipyard workers killed during the 1934 General Strike. He walked next to the carriage carrying the bodies as it meandered down Market Street, where residents gathered to protest the killings. The home eventually passed on to Duggan’s daughter, Leticia Welch, then to her son, and finally, to Steven Welch, Duggan’s great-grandchild, who is 53. The trolley stopped running sometime in the 1940s, and by the late 1980s, most of the funeral homes on Valencia Street were gone, bought by larger companies or closed because of competition, according to Welch. In those days, the obituary sections of the local newspapers often directed people to funeral homes outside of city limits. As a young boy, Welsh had little interest in the family business. His dad was always working, and his school friends made fun of the fact that the family used their van to transport dead people. It was only when he went off the college that he felt the urge to learn the trade and studied at the San Francisco College for Mortuary Science. Nowadays, the closest mortuary school is in Sacramento. Funeral homes across the Bay Area are run by other descendants of William and Henrietta Duggan, including Driscoll’s Valencia St. Serra Mortuary near 26th Street, and another in Daly City. As a child, Welch did not know his Daly City relatives. Now, in adulthood, he has met them. Still, he said, shrugging: They are competitors. The public assumes it’s an easy industry. “People say, ‘Oh you never run out of business,’” Welch said. But staying afloat has been hard at times. In the ’60s and ’70s, business slowed as many of the Irish and Italian families who had served as the funeral home’s primary customer base left the city. Today, the city’s traffic makes it hard for the limousines of a funeral procession to reach the cemeteries south of San Francisco. Although business is better, most of Welch’s income comes from properties he has developed. He continues to run the funeral home out of love of the trade. Welch is unsure how they will commemorate the business’s 100-year anniversary. He is thinking there will be an event to thank the families, friends and other supporters. As for whether Duggan Welch Funeral Services will stay in the family, he’s unsure. He has two daughters, but he doesn’t want to pressure them to take over. His niece, however, recently joined his staff. I was privileged to live and work at the Duggan Welch funeral home while I attended San Francisco College of Mortuary Science 1980-81. Thank you Bill Welch! Congratulations on 100 years of service!